Along this quest for knowledge on the architectural orders I’ve realised that the moulding plays a huge part in getting your work right. While doing a bit of research for a door surround job I was asked to do, I had to match the architectural orders, I found out some useful information on mouldings and when and where to use them online and the odd book. The best source of research was the book ‘Get Your House Right’. Thats my goto book now. If you do this type of work its a must have. You will find all the info below in ‘Get Your House Right’ but if you don’t have it then this might be handy. This is just my take on composition and how I work it out in my mind so feel free to research yourself, I’m pretty happy with my understanding of it so far, even if it is a heathens way to look at it. Orderly composition The two mostly used types of mouldings are supporting and terminating. The terminating is defined by having an outward emphasis where as the supporting has an upward emphasis, the easiest way I find to tell the difference is that a terminating is concave where the supporting is convex. The terminating moulding can be found at the top of a composition and it provides a visual termination, used almost everywhere else that a terminating moulding isn’t used is the supporting moulding, in todays construction it tends to only do what it should by visual means thanks to modern building materials. Visually, the supporting moulding transfers the loads and supports the weight above. Another way that I have it in my mind is that the supporting moulding is taking the weight so has to be strong, the convex profile bulges out like a muscle, yes pretty weird way to look at it, basically it’s a heathens way of looking at different types of mouldings! Ornament on mouldings Ornament is sometimes applied to a moulding. They are not just applied to anything but applied with a purpose and tie in with the profile of a moulding. As you can see from my artists impression of a leaf and dart ornament, its profile is a cyma reversa, cyma reversa means concave on the bottom and where the top is convex, cyma recta on the other hand is convex below concave. Egg and dart has a quarter round profile. My understanding is that both could be used as a supporting moulding. If you look at the book ‘Traditional American Rooms” there are a few examples of egg and dart as supporting. 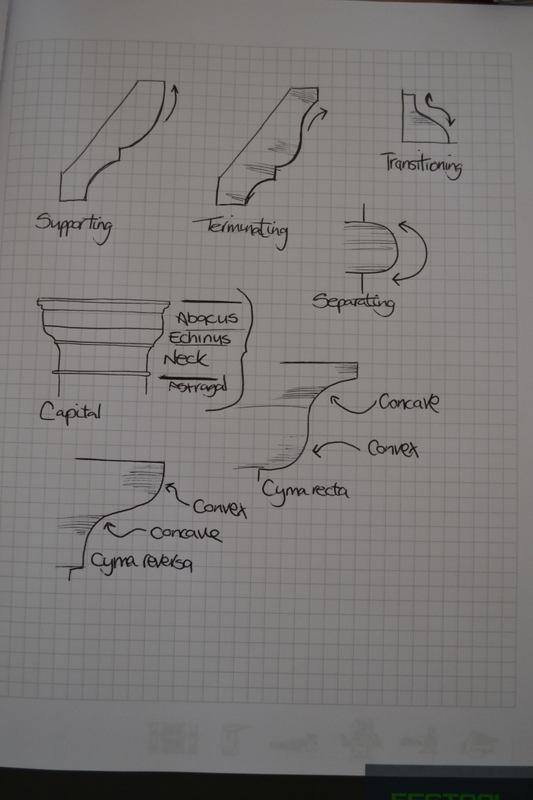 The way I see the composition is that anything under a terminating cyma moulding has to be a supporting, that includes ornament mouldings too. I may be wrong, I have been a few times before. Transitioning mouldings A transitioning moulding can be found where you have the transition between vertical surfaces, for example where the shaft transitions into the capital at the top of the column and again where the shaft transitions into the base. The transitioning moulding begins and ends with an emphasis on up and down. A moulding similar to the transitioning moulding in my artists rendition at the top of the page will do fine, there is a few different variations but stick to the ‘up and down’ rule and you can’t go wrong. I have a great book called “Get Your House Right” and I was going through it when starting to draw out an entrance way. I came to page 51 section 3.22 and noticed that there is a diagram of a cavetto and a quarter round, I thought the descriptions were mixed up, I should say mixed up in terms of the way I’m used to seeing them. I asked some folks in the know and the book is in actual fact correct. Perhaps it could be the cutting blade that would form the moulding that the book is describing. In that case it would be correct but for my layout work and drawings I will stick to the way I see a concave and convex moulding. I spent a bit of time scratching my head thinking that I’ve missed the path somewhere, like anything we do, there is certain ways that you remember stuff and if the end result is all correct then who’s counting. Separating moulding A separating moulding can be used to on column bases, to me they distinguish the base as a separate entity from the column and it is pretty easy to spot, you will also see them on bead profiles. To me this is a bit trickier to understand what they do, In future posts I will explain how I lay out a column and describe where each measurement comes from. So I know where a bead profile goes and that it is called a separating moulding but I don’t know why its there. I’m sure it will come to me as I read on. A separating moulding has a horizontal emphasis, an easy way to tell is that it starts and finishes horizontal. The separating moulding has also been used as ornament from time to time, from my drawing above you can see a bead and reel ornament matches the bead separating moulding nicely.